Club Sponsor – Britannia Carpets - 1874 Northwich F.C. 1874 Northwich is absolutely delighted to announce that Britannia Carpets have agreed to continue their sponsorship of our football club. 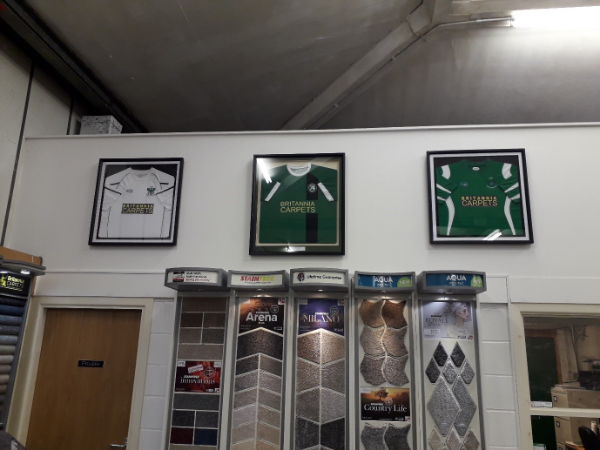 This is very welcome news, Britannia Carpets is a popular, local, family run business renowned for quality and customer service and 1874 has been proud of its association with them since the club was formed. During the discussions, Britannia Carpets highlighted that they were extremely pleased how the link with the club had developed over the last six years and they had no hesitation in wanting that to continue in the future. We would like to sincerely thank Britannia Carpets for their support and friendship and look forward to continuing the close relationship we have with them in the future. 1874 is extremely grateful to all of the local companies that offer their support and we would urge supporters to use their services whenever possible.